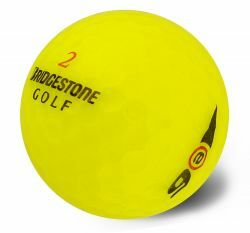 The Bridgestone e6 Yellow 2016 is the softest multilayer golf ball on the market, that is designed to improve your accuracy, hit straighter shots, and your overall game. The newly engineered Web Dimple enhances surface coverage for improved ball flight for more distance. The new e6 features a soft gradational core, anti-side spin inner layer, softer Surlyn covered for that improved feel, and a 326 Seamless dimple design with New WEB Dimple Technology. PLEASE NOTE: This item will contain various year models of Bridgestone e6 Yellow. Switch to the e6 and feel what it is like to gain accuracy, distance, and a decisive advantage over the competition. The e6 is a high-performance ball with a soft feel. It is designed to produce low driver and long iron spin for incredible straight distance. The advance mantle and cover work together to provide incredible approach and green-side performance. 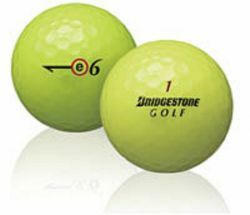 Bridgestone E6 Golf Balls are perfect for golfers of with fast swing speeds greater than >105 mph.